2019 is the 25th Anniversary of the first festival, and to celebrate we extended the festival to finish on the Monday. This enabled us to add more workshops, especially those relating to dancing and singing, something that members have been asking for. We are also welcomed the return of the Reed Island Rounders whose founders, Betty Vornbrock and Billy Cornette, first came to Gainsborough in 1996 on their honeymoon, returning as performers in 1998 and 2003. Following the formation of FOAOTMAD in 1993 the first annual festival, originally referred to as a "gathering", was held over a February weekend in 1995, in Gainsborough, Lincolnshire; home of the late Keith Johnson, founder of the organisation. From small beginnings it has grown into an event that is now widely recognised as the biggest and best American old-time music event in Europe. It brings together a superb line up of leading performers from America, Canada, Europe and the UK. Currently held in the Queen Elizabeth’s High School in Gainsborough, a venue suitable for the large number of attendees, it takes place at the start of the school’s half term holiday in February, beginning on the Friday evening and ending early on the Sunday afternoon. Both indoor and outdoor camping are available at the school, and there is a choice of local accommodation for non-campers. The weekend usually consists of concerts on the Friday and Saturday evenings featuring all the artists. 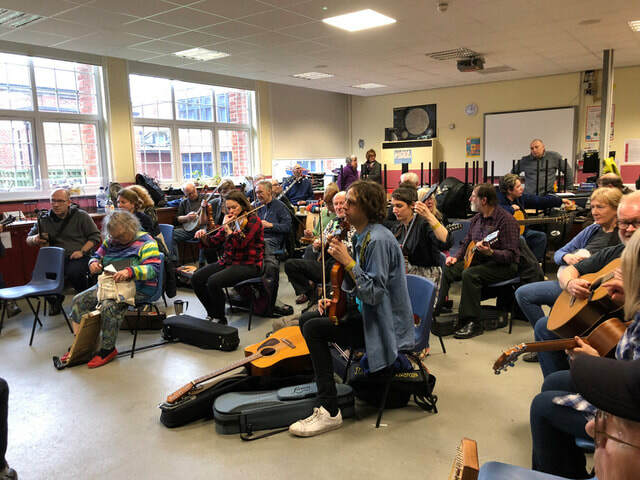 During the day there are various workshops with subjects ranging from beginners to advanced playing of a range of old-time instruments, harmony singing and singing techniques, Appalachian clogging, beginners flat-footing, writing tunes, slow jam sessions and many, many more. For those not booked for the festival there is also the chance to perform in the open mic concert or play in the many informal sessions that can be found around the school during the day, and if you are so inclined you can also join the late-night sessions that start after the concerts have ended. 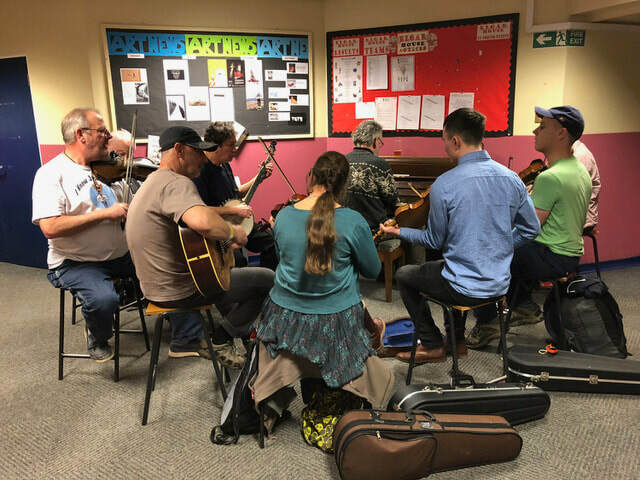 One of Keith’s original aims was to bring old-time musicians from the USA to the UK, and this is something that has been continued ever since. 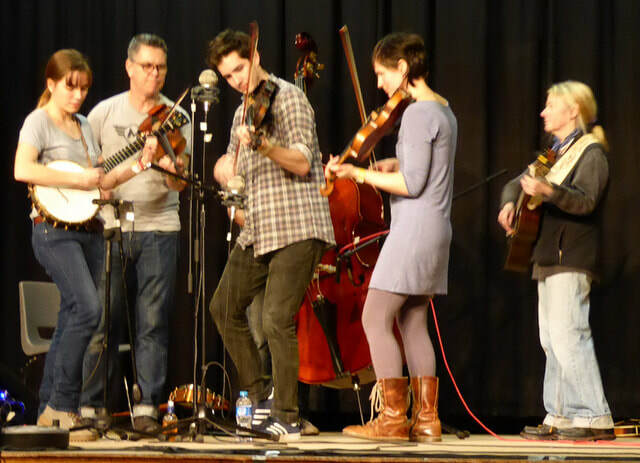 In recent years bands such as Red Dog Run, Uncle Henry’s Favourites, Sunny Mountain Serenaders and the Bigfoot Stringband have all appeared. Other musicians such as Jason and Pharis Romero, Howard Rains and Tricia Spencer, Erynn Marshall and Carl Jones and Evie and Keith Ladin plus many singers, bands and dancers from the UK and Europe, have also graced the stage at the festival.